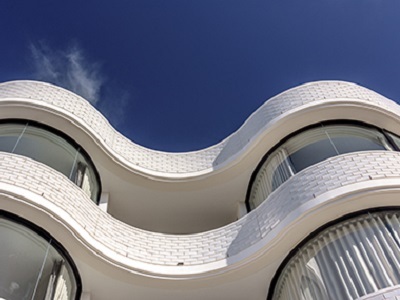 Curved glass from Bent and Curved Glass helped complete the flowing façade design on a new apartment development in Bondi Beach. The design by Tzannes Architects sought to interpret the prevailing streetscape language of the Campbell Parade conservation area along the Bondi Beach promenade in a contemporary style. Curved glass was an essential element for creating the undulating flow of the apartment building’s façade design. The bays and balconies helped maintain an uninterrupted view to Australia’s most famous beach. To minimise the number of silicone joints as desired by the architects, the glass was manufactured with a complex curved profile incorporating flat tangents at each end. Key challenges for Bent and Curved Glass came from having to ensure optical quality and dimensional accuracy at the highest level. The flowing façade layout was repeated with the frameless curved toughened glass balustrading to the penthouse terrace above. BCG worked closely with the architects, developer, builder and installation contractor to provide the glazing design solutions as well as ensure the required aesthetics would be achieved within very tight budget constraints.